BANGOR, ME: Every sports team has the goal of making it to the big championship game. The moment in the spotlight where they have the opportunity to call themselves the best. 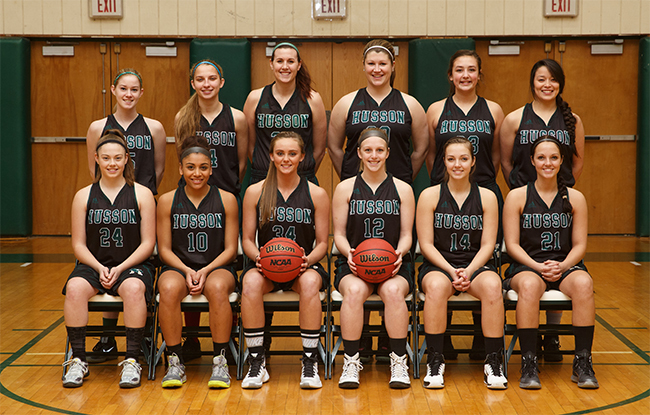 The Husson women’s basketball team has the opportunity to make this achievement a reality. They will be hosting and participating in the North Atlantic Conference tournament. 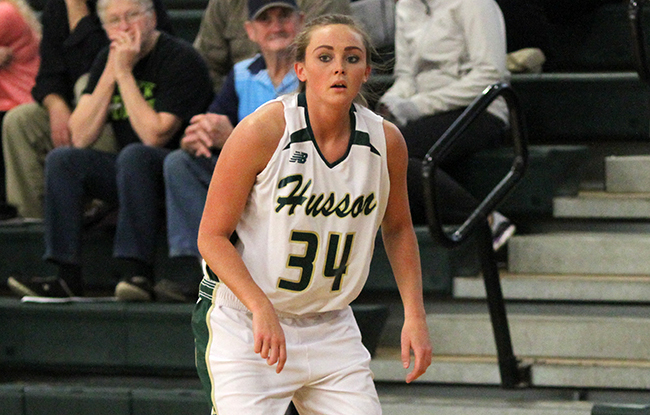 From the start of the regular season in mid November, to their final regular season game, the Husson lady eagles have been striving to make it to the big stage with their eyes on the prize. Head coach Kissy Walker has been coaching the women’s team for twenty-five years. She has lead the team to four MAC championships in the 90’s, and won back-to-back NAC championships during the 2010 and 2011 seasons. So she is no stranger to the big stage, and winning it. Momentum is a huge part in any sport. If a team goes on a winning streak towards the end of the season, that may be able to carry over in to post-season play if a team can keep it up. The eagles ended the season winning seven of their last eight, with five of those games being on the road. Being able to win key games on the road is what can separate good teams from great teams. “They seem to know how to win, and they don’t panic, and they just keep playing and I think that’s a good characteristic to have.” The eagles may not have had the greatest road record this season, winning nine of fifteen, but they were able to win key conference games towards the end of the year in unfamiliar territory. On the other side, winning home games is just as important as away games. Being able to defend your home court is something that most teams would strive to do. No one likes losing at home. The eagles didn’t have to worry about that too much, ending the regular season with a perfect record of 10-0 at home. This is an important record because it shows the confidence a team can have playing in front of their own home fans. 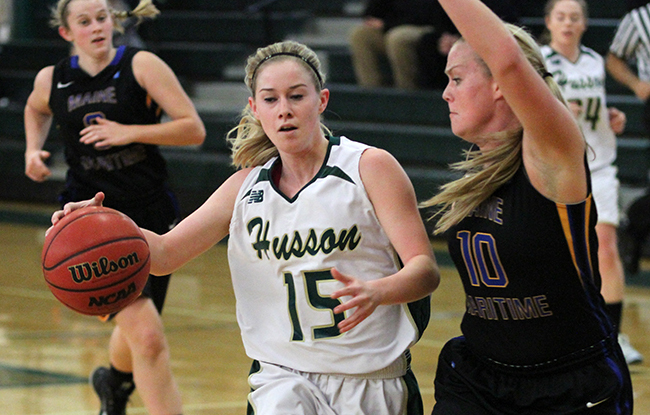 “We’ve shot the ball a lot better, and when the balls going in everything else seems that much better.” Since the NAC tournament is being held on Husson’s home court, they have the opportunity to extend this record. Now basketball isn’t a one person game. It takes a team to succeed. The lady eagles have a team where every girl is needed to do their own job. They have freshman all the way to seniors that play certain roles in the game. We sometimes see teams that only play six or seven players and then stop there. But every player on the eagles can make a difference. They only have three girls that average over ten points a game, so that means they use their bench to their advantage. They are able to bring in players that can produce and make good use of the minutes that they are given. “Everybody plays a role and everybody contributes. Even if someone goes in for two minutes, if they can give us two really good minutes, it can be key for us.” Having a bench with players that can take control of the game when needed is something that is key to the overall success of the team. Making it to the post season is a goal that all sports teams strive for. They want that chance to be number one. The lady eagles have had a successful regular season and now look to continue their season. Their semifinal match up with New England College will be held on February 26th at 3:00 pm at the Newman Gymnasium on the campus of Husson University. All championship games will also be held at Husson on February 27th.